Just wanted to let you know that we are not gone and we are not dead but unlike others who make their living blogging, we really do have jobs! I am a marketing communications specialist for a mid-size manufacturer and I handle their day-to-day marketing programs. I work on the company website writing code and doing updates and maintenance, designing print collateral and handling SEO, Google Analytics, Email marketing campaigns, and managing trade shows and vendor relations. On the flipside, I also handle their IT purchases and in-house tech support, so my job keeps me busy and while it is not my passion it pays the bills and my kids eat. Throughout the years, I have worked in several market sectors, banking/financial services, aerospace, power, industrial, and structural, always handling marketing, juggling design and programming functions. I am well-versed in many marketing disciplines. However, clothes have been my life-long passion and have always considered myself well-dressed, wearing made to measure and from time to time bespoke suiting. My father and some older male figures that I respected were good examples. I am writing this post to help you find your passion, write and blog about what you like, for instance, I have had The Dicky Bow for over 15 years and I have held events, wrote blogs and even commented on men’s wear sites. I have even done reviews and acted as an image consultant for a number of people but I have yet to break through and make a living out of it. So before it’s too late, find your passion and run with it. Don’t follow my lead and allow the day-to-day minutia of everyday life hold your passion back! Find it and run with it. I am trying to devote more time to what I have a passion for and that is writing about classic men’s wear. In the meantime, check out these little tidbits on men’s wear and bespoke clothing that you can review from what I feel are some of the best sources of men’s wear on the Internet (not necessarily in order). Probably my most favorite to read about is an iconic figure in men’s wear, G. Bruce Boyer. Here is an excellent article on him in the Parisian Gentleman. If you find yourself in New York, I believe he is the Co-curator at The Museum at FIT if you check the website you might be able to catch one of the interviews that he does live. I attended his interview with the famous Rubinacci family, Mario and his son Luca which I enjoyed. Also check out the websites of these iconic tailors like New York Icons Angel Bespoke, Leonard Logsdail, and Andrew Ramroop owner of Maurice Sedwell in London. Find your passion, and I hope this information will help you make better choices on what you wear and by doing that you may help me continue pursuing my passion. Hey check out this video on Pitti Uomo (I hope to go one day)! Recently I was viewing a lookbook on beautiful bespoke clothing. The only problem with the lookbook was the fact that some of the clothes were beyond my reach financially. I like good clothes but throughout the years while I still like looking good, new responsibilities have popped up. A home, two cars, kids and the like. While I still like looking good, I had to get creative about my wardrobe, I started to look for new options since even some made-to-measure lines have gotten too expensive for me. So I started to look at made-to-measure outfits online and started to deal with local tailors who can make certain items but have stopped working on suits since they can be labor intensive especially when many of them are getting up in years. For instance, I found a tailor that can make me pocket squares and slacks. I found someone who makes bowties and ties. I found a company that can reinvigorate ties by reshaping, relining, and they do a thorough cleaning of the fabrics (in fact they specialize in ties and scarfs). Now, these things are not in this edition but I will be posting all that information online in one area so that you can benefit from the same tricks that I have been using for years and I can still cater to the look that I have grown so accustomed to. So download my think book and please share it. If you have any questions, please email me at etoro@thedickybow.com and I will get back with you as soon as I can. Enjoy and share the Think book. Soon the warmer weather will tend to dominate, so as a reminder start getting your wardrobe in order now. To give you a little boost, check out the images that I have been posting to get you started and I will provide the links to those sites so that you can start purchasing your new wardrobe now. Take Care, from your obsessed men’s fashion-forward blogger Eric from The Dicky Bow. Also one last thing, we will merge our site with Papillon Cravatta, and our site hopefully will have more information and images to help you with your sartorial expression. You know that sometimes when I come home, I do not immediately take off my suit unless I planned on going to bed. Most of my suits are comfortable enough to wear while I am just sitting down. Your clothing should be like a second skin and comfortable enough to wear while relaxing. There really are no reasons why you cannot purchase a comfortable suit, so whether its ready to wear, made to measure, or bespoke it should be comfortable to wear. Just to let you know that I did not develop this video but I think it’s a straight-forward approach to buying your first suit. So first of all the video is developed by Justin Jeffers from The Fine Young Gentleman. The young man behind the video is the creative behind Jay Butler shoes, they design and produce beautifully-crafted loafers. First I want to say that I like to send videos and articles from other sites to you. I am not one to care about viewership, what I do is because I love clothes. I have been wearing suits, blazers, pants, shoes from RTW, MTM to Bespoke for over 30 years and I still have some of them. While I never got a lick of fame from blogging, I do like to share what I have been privileged to learn as a young man and besides that, I am one of the few men of color who loves to blog about gear. I am old-fashioned and while only in my 50’s, I learned a lot as a young man in my 20’s from those around me. So many of the articles that I see and read, while I can relate to them, I never had any problems dressing because I was doing this 30 years ago and who knew that the Internet would have lots of experts and so-called experts on the subject of men’s clothes today. There are my favorite blogs that I do like, here are but a few but I cannot list them all but these are my top reads when I want to see what is going on and I rate them in the order that I read their posts. Like I said my top reads but I also like Brian Sacawa from hespokestyle, I like the blogs of Salvatore Gagliardi, Oliver Wicks Brand and I like The Brooks Brothers Magazine. So without saying any more, check out the Justin Jeffers video and if you like it sign up for his blog. I really just like what I do. Just wanted to give you a heads up that The Dicky Bow will be merging with Papillon Cravatta and that we will eventually phase out our FaceBook presence. Throughout the years it has been quite difficult to maintain the presence of two separate entities and fill them with interesting content that our readers enjoy. So starting in late September, we will begin to merge the two sites and move all the content over. So we will be operating here for a little while until we can merge the two sites. Still come and we will keep you up to date on what is happening at The Dicky Bow. Just following up with the images that we recently posted. As you know that we have been quite busy developing our in-house line of suits and shirts. Just to let you know we are working with a new tailoring outfit. We have decided to end our relationship with some of the firms that we have used in the past. The problem arose due to compromising quality and standards. So we decided that it was best to part ways with the last two firms since they were profit driven, lead times were long and quality and service were somewhat compromised. We want to be able to deliver a superior product with less lead time (3.5 weeks instead of 4-5 weeks). So we have built a partnership with another firm with a great product and we look forward to seeing your suits and shirts fit well and affordably priced. Click on the link to view Mark Scott Bespoke Suit Packages. The featured tailor of December and January. It’s been a while since we posted anything new, we are not dead just enjoying summer. The other problem is that I do have a job as a print designer/web developer, even though this blog is what I love doing. I was walking around the financial district, the other day when I noticed there are more high end shops now opening in lower Manhattan than before. The days of the financial empires seem to be taken a different spin, with firms restructuring and downsizing operations, Wall street isn’t as crowded as it once was, except with tourist. I worked for the banking and finance industry for 24 years, in 1982 I worked for Apple Bank as a teller, eventually learning reorganization I worked at US Trust, Dominick & Dominick, Manufacturers Hanover Trust, JP Morgan Investment Management and Bank of New York. After Bank of New York, I worked at a small but reputable agency that handled collections as well as A/R purchases for large medical and consumer groups (still finance but interesting), I was their marketing manager and E-commerce developer. Today for the last decade or so, I have worked as the marketing manager for two different manufacturers. Things changed and I gotten older but still love wearing my suit and tie, so my son took this picture of me while I was shopping for some clothes in lower Manhattan. What I am wearing, Michael Andrews summer weight bespoke gray jacket, cream linen pants, english spread (blue) shirt, textured brown silk tie, hat from J.J. Hat Center and woven leather shoes from Cole Haan. So I am not dead yet, I will be back soon writing new posts and showing off combinations that I think look good together. My blog is for the everyday guy that likes to look good, my clothes are all purchased by me and combinations are ones that I pick, so you know that our site is not skewed towards any trends or retail chains, we believe that you can look good on a modest budget. Rodolfo Alfonso Raffaello Pierre Filibert Guglielmi di Valentina d’Antonguella, professionally known as Rudolph Valentino was an Italian-born American actor. He was exceptional when it came to style, in fact even today, I look at his photos and incorporate some of his style into my wardrobe. He led an interesting life and was categorized and despised by many men in his time but of course he was loved by women. There are also many stories that circulate about him but from what I read, his life was somewhat of a struggle, he worked odd jobs until he found his niche, and despite his good looks many still criticized him. This post is not about his life, we can read about that through other publications and sites, but his style was one worthy of imitation. He had a manly style about him and also kept himself in shape and worked at his appearance. So I wanted to share a few pics I found online. I like the fact that he was into peaked lapels, his suits had nice silhouettes and were well-made. I am not sure if they were bespoke but nonetheless he made his style work. In fact I am looking for a leather coat like the one that he has on in the image below, so that I can have it for winter. Enjoy the photos. We wanted to thank everyone who showed up to our May 14th event. It was filled with good food, fine wine and great fabrics. Enjoy the pics to our second event in Bridgeport CT.
Just this past weekend, the team at Papillon Cravatta, our spin-off Bespoke Event Company held their very first Bespoke Event for men. We wanted to keep it small, to select persons that appreciate bespoke clothing. We had a wonderful turnout and with close to 30 guests it was a success! We wanted to thank Theophilus Cooper of Royce Redding and the owner Dan Oke for making sure that our patrons were cared for. The event was held at the Bridgeport Innovation Center in Bridgeport, CT. An area were many local artists and musicians have their studios and work spaces. We love the urbanized vibe at the Made in Bridgeport Studio, owed by Robin Gilmore and Gerald Moore, who hosted our event and for the lovely vintage cufflink selection that Robin curated and put on display for our clients to purchase (A special thanks to them!). We had a blast and our guests came from Bridgeport, Norwalk, Stratford, CT, New York City and as far as Atlanta, GA. We have many more events to come, but as we stress, our events are curated and sad to say everyone is not invited but if you would like to be considered for attendance, just send an email and we will put you on the e-mailing list. EDB will also setup at various locations by request where men want to spend a little more but lack the access to Bespoke clothes. We are also looking for corporate sponsors. EDB is redefining men’s fashion by bringing true Bespoke (not Made to Measure) men’s fashion events away from NYC and other big cities and having them held in areas where redevelopment is needed. 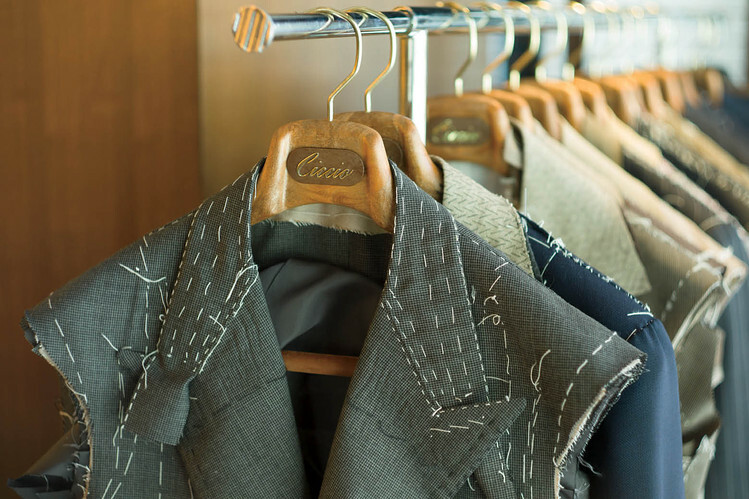 Imagine custom suits made from fabrics curated from the best fabric houses in Italy and England in your backyard. Bespoke suits take an average of 6 weeks and shirts an average of 5 weeks. Our prices are far better than what you will find in Mitchell’s of Westport or any other Bespoke clothing maker (Brooks Brothers, Paul Stuart, Paul Smith) and with similar or higher quality fabrics and linings that you choose yourself from our selection and of course you will be fitted by one of our professionals. On Wednesday (March 26, 2014), I had the privilege of listening to the conversation that G. Bruce Boyer had with Mariano and Luca Rubinacci at the Katie Murphy Amphitheatre, in the Fred P. Pomerantz Art & Design Center, at FIT. The discussion centered around Neapolitan tailoring and its influence in the world of fashion. It was a treat for me to hear the discussion since the Rubinacci family is well known for their bespoke tailoring empire. They did mention that they had over 40 tailors but they handle the decisions in regards to the customer. The conversation was enjoyable and entertaining with both Mariano and Luca giving insight into the Neapolitan way of tailoring, as they mention its just not the clothes but its really a way of life. Well, we are back reporting on some of our favorite designers. Romano Ridolfi revealed the third season of his latest collection called RR at the last Pitti Immagine Uomo. This year Romano Ridolfi is focused on pants, which from what we understand range in fabrics and wear; from every day going about your business pants to the more classic formal pants for going out on the town. As we reviewed the images that we received, it seems that he has a good selection of fabrics but we were impressed with the style that he is focused on, what we call clothes for the well-worn traveler. We also like the fact that his clothes capture a bit of Americana, from his pants to his jackets, the clothes breathe the essence of being out in the west and just traveling through the country exploring its many sights and listening to its many sounds. We love his use or fabrics from the denim shirts, rugged jackets, wool ties and cotton slacks in various flavors. The website tells the story of writers, musicians, and dreamers in search of inspiration and we can definitely say that this collection was inspired from a time of dreamers when young people were exploring the sights and sounds around them. We enjoyed the images that were supplied us and we like the fact that his clothes will inspire a whole new generation of writers, musicians, and dreamers, rock on Romano! Hello, it has been a rough year for us here. We have been working keeping the business going and updating systems as well as making investments in our location. We apologize for not keeping up with content, but we hope to make it up to you. We have some nice things going and we are working on opening a place where local men can buy the things they need for their wardrobe. We will also include photos from designers putting out new collections as well as sponsoring local trunk shows. Stay tuned for our Cufflink and Tie Clip Show and we are working on combining our show with an upcoming vintage show. If you have any questions or would like to learn more about what we are doing, email me at etoro@thedickybow.com. In the meantime take care and stay tuned for our upcoming posts on men’s fashion. While reading your blog, I began to reflect on my view of fashion, clothes and who shaped my thinking. I began to care about my clothes and fashion because of my grandmother. She used to work for wealthy people who would give her their old clothes. Old to them but for my grandmother, they provided an opportunity to create her own “designer” pieces. She would remove collars and attach them to an old coat or take other clothes that she was given and reconstruct them to create her own “bespoke” pieces. My grandmother was a seamstress and she would create costumes for my dad to wear when he performed on stage. This meant that the fabric or parts from the hand-me-down clothes could end up on my dad’s custom outfit. My grandma was also a stylish lady. She did not have much, but she took pride in how she looked. This was her pattern regardless of where she as going, she never left the house unless she was “together”, as they say. The trickle down of my grandmother’s sense of style and seamstress skill was, my dad began to sew. He too never leaves the house unless he is well dressed, and this despite not beginning a wealthy person. He goes to thrift shops and the Goodwill in wealthy neighborhoods. Like his mom, he will reconstruct a rich man’s used expensive suit, sometimes shirt, and then adds a tie with a fancy note or a bow tie. He can mix and match colors that rival those seen in men’s fashion magazines. Though I am not a man, my grandmother and my father have instilled in me the love of women’s and men’s fashion. Watching them has helped me to create my own sense of style. I too am a seamstress and like to create “bespoke” items of my own. These thoughts bring to mind what I see today with the current generation’s thoughts on men’s style. I wonder are they aware of how what you wear speaks to who you are. For my grandmother and my dad, what you wear speaks to your dignity, how you walk, and who pays attention. Depending on what you are doing or where you are going, your treatment by others can be affected before you open your mouth. Most, including myself, cannot afford a custom-made suit or outfit, but, “bespoke” does not always have to mean that lots of money are spent. I wonder how the young boys, teenagers, and young men today determine their style. I spoke to a young man in high school and he told me that most his age look at celebrates and sports personalities to determine their style. How unfortunate, I wonder what would happen if you could show some of these young boys how to develop a style of their own, what would the clothing industry look like and what would be the style today. The other day, what to wear? Sorry about the slow posts but I do have a day job. I wanted to hang out with a few of my friends but could not decide on what to wear, to grab a bite to eat at a little bistro in CT.
Below are the combos I came up with but I wasted so much time that I ran late to the meal. Tell me what you think? The silk purple and my other choice a greenish plaid tie had to match a dark blue plaid two buttons bespoke blazer with a light blue shirt with white collar and french cuffs. The shoes were brown brogues, but I will hold out on the name of the shoes. I do not want you to buy the same pair. I also paired a grey glen plaid suit with a purple gingham shirt with a lighter color bow in the purple family. Just to let you know, if you invite me to dinner, I am always late, the reason I always try on several combinations before I feel comfortable. Send me a comment on the combinations! So tell me what you think of the combinations that I tried to put together and give me your input. I thought that this article would interest my readers. Sometimes you come across a great article, I like reading fashion media across all the wide spectrum, from the tabloids to the specialty magazines. 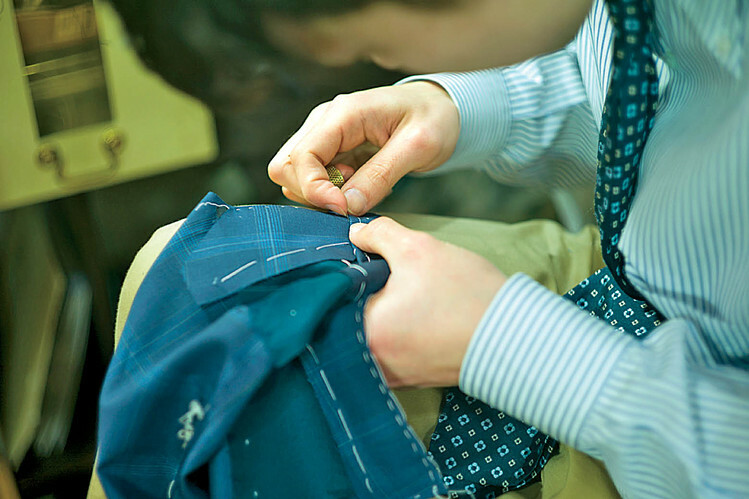 This article is from the Wall Street Journal and it’s about bespoke clothing from Japan. Enjoy reading it and I included the link as well if you want to read it from the Wall Street Journal. Photography by Yoko Takahashi SUITING UP | Jackets in the process of being hand-tailored hang in Ciccio’s Tokyo studio. Each typically requires three fittings and starts at $4,500. AS I ENTER THE SECOND FLOOR suit-making shop, the studio’s master tailor—a man called Ciccio, wearing a soft-shouldered, subtly pinstriped gray suit—greets me with a smile and a casual “buon giorno.” After asking if I’d like an espresso, he leads me to a leather couch where I am left to browse dozens of swatches of the finest English and Italian fabrics. Every detail here leads me to believe that I’m sitting in a traditional suit-maker’s atelier in Naples—except that I entered the shop from a busy Tokyo street, and the real name of the master cutter standing before me is Noriyuki Ueki. As a tailor, he goes by the nickname he earned in Italy. His work—crafting Neapolitan-style suits in Tokyo and elsewhere in Asia—is so highly regarded by Japan’s fashion elite that he’s able to charge as much or more than the top Neapolitan tailors who regularly visit Tokyo (more than $4,500 for just a sports jacket). 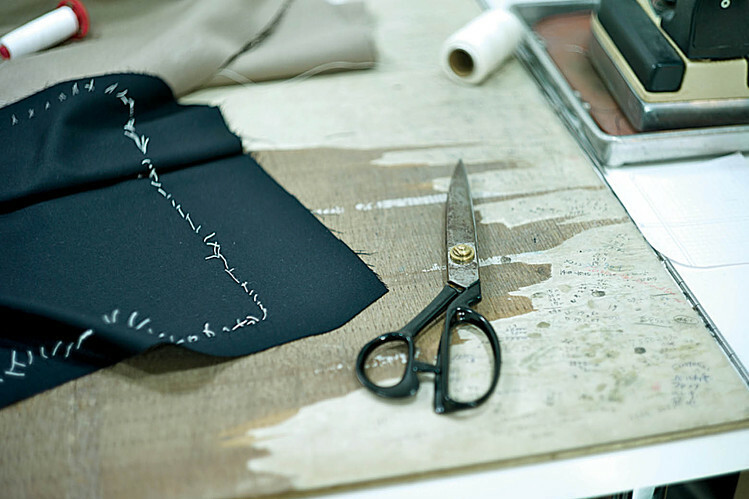 Photography by Yoko Takahashi THE ITALIAN JOB | Hand-stitching is the hallmark of Neapolitan tailoring. Photography by Yoko Takahashi All patterns are cut by hand. There are a handful of young Japanese like Ciccio, all under 40, who have aggressively pursued their passion for fine tailoring to the point of apprenticing thousands of miles away at sartorias in Naples, sometimes for years, before returning to Japan to craft handmade suits in that southern Italian city’s signature style. Meanwhile, there’s an acute shortage of young Neapolitans willing to take up their city’s labor-intensive approach to suit-making. Almost none possess the skills or the confidence to branch out on their own, as Ciccio has done, leading to the strange possibility that, in a decade or two, the finest Neapolitan suits will be found only in Japan. 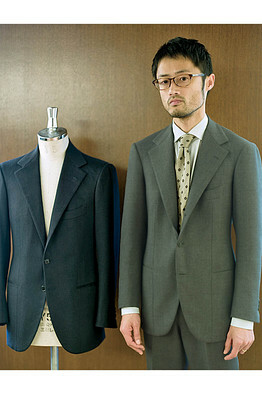 It’s no surprise that traditional suit-making has such a strong presence in Japan. The country remains attached to an almost Mad Men–esque vision of workday attire for men, with glossy magazines devoted entirely to men’s suits—most notably a publication calledMen’s Ex that, in a typical issue, covers everything from shoe-polishing techniques to pairing shirt and tie colors. Back issues of Men’s Ex provide the most extensive guide to Naples’s lesser-known artisan tailors, surpassing anything available in English—or even in Italian. A year ago, while on a trip to Italy, I often encountered Japanese travelers at hole-in-the-wall sartorial operations on remote backstreets of Naples, including some places I’d learned about only from locals in the neighborhood. What I also discovered on that trip was that most master cutters and tailors in Naples began learning their trade at or before the age of 10—during an era of post-war Italian poverty when child labor was the norm—which means that the top tailors there are, at the youngest, in their sixties. Many more, though, are in their seventies or eighties and long retired. Most wonder openly whether a tailor who starts learning this craft at the age of 18 or 20 can ever attain the technique necessary to become a true master cutter. When he returned to Japan, Ciccio founded his own atelier in the fashionable shopping area of Aoyama. Six years later, he now employs two full-time workers, each of whom dreams of following in his footsteps by making a journey to Naples to apprentice there. Ciccio’s business has expanded across Asia, and he now travels to Seoul to meet Korean clients. At 35, Ciccio is the most well-known of the young Naples-trained tailors in Japan, but there are others in Tokyo and across the country: Yusiche Ono, 37, went to Naples as an apprentice a year after Ciccio; Noriyuki Higashi, a 34-year-old who makes suits in Osaka under the Sarto Domenica brand, is so fascinated by Neapolitan suit-making that after returning home from a stint in Naples and taking a day job, he spends nights and weekends making jackets. 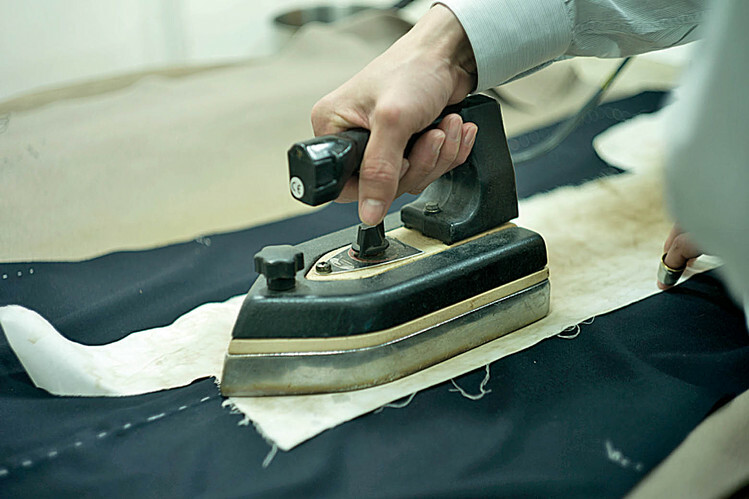 Unlike every other Neapolitan-style tailor I know of in Japan or Italy, Higashi also does everything by hand and nothing with a sewing machine. Ono nods, folding over a slice of his pizza. “Some-times, back here, I feel that my eyes are getting rotten,” he says. “That I’m losing the ability to see what looks right and what looks wrong. That’s something I never felt in Naples.” Ciccio and Ono are both trying to explain something that’s difficult to hold on to a world away from its origins: the Neapolitan sense of effortless, instinctive and uncultivated style. Their dedication has allowed them to master physical techniques. Now, as they mature, the question is whether they can also cultivate what Ciccio identified as the beauty of authentic Neapolitan tailoring: a style all their own. I like reading other blogs and there are some outstanding ones out there. One of the best I come across is that of the Gentleman’s Gazette. Some would say why would you write about someone else? The reality is that the Gentleman’s Gazette is great, I read their posts all the time. At times we both do product reviews and I respect the fact that he has a wealth of information on men’s gear that he pushes and shares down the fashion pipeline. I enjoy the way he dispenses his information on men’s clothes. His articles are great, his images are superb and what Sven Raphael Schneider has done is fabulous I hope he keeps it coming! I like focusing on the maintenance of your clothes and the nature of being a dresser but Mr. Schneider does an excellent job on the functions of clothing, historical views, fashion trends, individual icons of style and the like and I like the images he posts on his blog, great detail. I like fashion and I like reading the Gentleman’s Gazette, in fact, I do not read Esquire and some of the other blogs as much since I think they get to sidetracked and also tend to be slanted towards the trendy and unwearable stuff designed for those with a 14 waist. So that’s all I know you will like Gentleman’s Gazette, so I posted a link to one his recent posts. Great Stuff does not go unnoticed! Made in Bridgeport is a rare find in the city of Bridgeport. In fact, when you are there, you are transported to a different place out of time. The store reminds me of the fancy boutiques that line the streets in the NOHO section of NYC. As a displaced New Yorker, I was amazed to find her store in the city of Bridgeport. The proprietor Robin Gilmore has moved the store to the newly renovated Arcade Mall in downtown Bridgeport. She is on the first floor in suite#2, from what I understand this is one of the first malls in the country. Her store definitely has the vibe to be in this great location. Made in Bridgeport, sad to say is primarily for women, but we men are not out of the picture! She boasts a great selection of high quality vintage and slightly used designer clothes. To give you an indication of the quality of clothes that she has, I saw a near perfect pair of Manolo Blahnik shoes for women, tough luck for me (many are not aware that he does design shoes for men). I tried on a beautiful vintage linen blazer but it was size 44R, a little too big but nonetheless it was nice looking. She sports a really nice selection of vintage ties for men, in fact I picked up two myself and she does design custom jewelry out of industrial material. She repurposes salvaged hardware and industrial material into jewelry, kind of like steam punk and high fashion rolled up together to provide you with pieces that can be worn for almost any occasion. I like going to her store, since she provides a fashion buff like me with many ideas on what to do next. I also understand that she will be doing a trunk show and I will post the date so that readers who live nearby can attend and possibly acquire vintage pieces for their wardrobe as well as one of a kind jewelry. Enough said, I spoke too much, so I decided that it was best to provide you with photos on her establishment and I also provided you the address below so that you can visit and also take one of her workshops, she also teaches jewelry making. A well-cut suit, in fact, that is what every man should attain to own. There are many men stores out there but sell suits over the counter that require heavy alterations. Sad to say these off-the-rack suits are not always your best option when it comes to making your best impressions. The shoulders may be too tight or wide, there may be gapping on the jacket and you may find that the sleeve lengths are not great since you will have to adjust the sleeves as well. After the alterations are over, it will cost you. Before purchasing any suit, do the math. If the suit is $150 and the alterations are close to $90-125 after all is said and done you dropped $300 into an ill-fitted suit. It is often better to buy a better quality suit for $300-$400 or a made-to-measure suit for $600-$800 and be happy with your purchase. We understand that at times our pockets could be shallow due to other expenses. However, a suit purchase is important. The suit can set you apart from others, a good fit will tell others that you take pride in how you look and your children will thank you for dressing your age. Before I give you the 101 basics of purchasing a suit keep these things in mind, I have heard of some suggestions of buying a suit that can be worn year round, basically the quality of the wool will allow for its usage in different climates and while there is some truth to it, I disagree with that mindset. Instead, I prescribe to the idea that a suit should be purchase for Spring – Summer or from Fall-Winter, using this concept you won’t wear a suit that is too heavy for summer and too light for winter, besides sweating like a pig or freezing your buns off, you will look ridiculous. Buy a suit that can be worn in weather that is similar, like spring to summer. That will give you good usage but not wear the suit out. If pockets are shallow, purchase solid color suits, Brown, Blue, Grey, Beige/Tan or Khaki. Buy Black for weddings or special occasions, they are the hardest to match. While wool weight is important, check workmanship of jacket and pants, look for irregularities, nothing is worse than a suit with a blemish, it will stand out. Please check the suit content, wool blends have gotten better, but I still prefer 100% real wool. Stay classic, stay away from skinny suits, I mean STAY AWAY! Stay away from trendy looking suits, same principle, STAY AWAY! The accessories often make or break the look of the suit. Again, stay away from ostentatious colors, white/blue and even pink shirts are always better options, you can choose collar styles that enhance the suit. Lastly, make sure that you purchase a suit with two or three buttons. Three is good if you are very tall and if the cut of the suit is classic, it will be around for a very long. Any more buttons that that (unless it is a double-breasted) and you can join the Steve Harvey Fan Club or join a Gospel singing group. I hope this helps and I have posted some photos below that will give you some ideas on how a suit should look and fit. Sorry, we were gone for the moment! This is to inform you that the Dickybow is coming back strong. We were gone for a while but decided to make the change to a physical location. We are now located in downtown Bridgeport CT in a wonderful space, located in the old Bridgeport Arcade Building which is over 100 years old. If you have any photographs or even writeups, we will be honored to place your information on our website. We will be back soon with new and exciting fashion article! For many men putting away your suit, jacket, shirt or overcoat simply means grabbing the wire or plastic hanger out of your closet and putting your nice clothing on the hangers that you collected from your neighborhood dry cleaners or launderers. The reality is you are damaging your clothes by using hangers that were not meant for that purpose. For instance wire or metal hangers are used mostly by dry cleaners and professional laundries to hang your shirts on after they have been cleaned. The hangers are temporary and are basically meant for transport to your home. For the record we like our shirts boxed, but you should never leave your shirt or suit on these hangers since they create marks, dimples or creases in your attire that will be hard to remove. This applies also to suits and jackets that are dry cleaned, the wire hanger with the shoulder shaped cardboard cover is just used for transport and not as a permanent hanger for your suit or jacket. In fact using common sense and the right hangers can extend the life of your clothes for a very long time and the right clothes hangers will keep your clothes looking great from year to year. There are a couple of factors that you must consider when picking out hangers. First the design, well-made hangers are designed specifically for certain parts of your attire, for instance a longer fully contoured hanger with wide shoulder flares are designed to preserve the suit jacket’s drape. The suit hanger is designed to follow the natural shoulder profile thus maintaining the overall shape of the jacket, nothing looks worse than a jacket that droops and loses its natural drape. Second, plastic or wire hangers are not designed for long-term support. Most hangers made of plastic and metal wire are generic and most commonly found in one-size fits all. Their poor design is because the main purpose for these hangers was for temporary usage and because they are cost-effective for the professional dry cleaner. Third, there are hangers designed for overcoats, jackets, trousers and shirts and using the right one means the difference in the life of your garment, with that said we took pictures of some hangers that we felt will keep your clothes looking great for years. We ask the team at Butler Luxury to send some samples so we could compare their hangers to some hangers we received from our favorite men stores. Let’s explain this by pictures that we took and added short captions. See above, starting from the bottom, we see a hanger for a suit with a felt covered bar (notice no locking bar) and nice size shoulder flares, the overcoat hanger with the wide shoulder flares, the flatter shape hanger design for shirts and finally the hanger designed for trousers, again no locking bar but a well-designed felt covered bar designed to grip your pants without leaving a crease. Below you see the trouser hanger from Butler and notice the felt covered bar which grips your pants and no locking bar mechanism which leaves crease and marks that will be difficult to get out. Shirt hanger well-designed, strong and shaped to preserve shirt shape. The proper hanger. Suit hanger designed to keep natural drape on jacket and protect pants. Hanger from Macy’s with locking bar, leaves crease in pants. We think you get the idea, using the best hangers go along way in protecting the personal investment you make in your clothes. One thing I appreciate about good clothing is that people respect a man that takes stock in himself. Of course, I invested in breathable canvas suit bags as well as a cedar filled closet but quality well-made hangers like the ones from Butler luxury keep your clothes in shape and gives you that same quality drape and feel even after many years. This is not a paid endorsement but if you want quality hangers for your wardrobe, please contact the team at Butler Luxury. The hangers that we photographed and tested came in a dark expresso finish as well as a deep butterscotch finish, so they also looked great in your closet. So remember take good care of your clothes, its your investment in you as a person! English: Many dry cleaners place cleaned clothes inside thin clear plastic garment bags. Just a few days ago it became spring! The only problem is that the snow and cold weather is still lingering but that is ok. Regardless of the weather, it is time to jump start your spring clothes, remember its good to have some color in your wardrobe. I like orange, tints of yellow, light blues and hues of green this time of year. Some may prefer other colors and that is ok, the point to remember is get your gear in line with the season. From time to time we come across great articles that we like to share with our readers. At heart I am a techie and I write and develop articles on web development and business. I am also an ardent fan of the TechRepublic website and blog. So as I was reading I came across this article that just does not apply in business but it is also the hallmark that men of style should live by. Finding the right combinations – day in and day out! Finding combinations can get quite tricky. Its a daily endeavor that fashion conscious males are extremely aware of. The battle between sophistication and being a clown is actually a very fine line that all fashion conscious men must walk. While I am no expert, I can tell you what combinations look bad and you really do not have to be an expert to see when certain patterns, materials and colors do not go well together. The way clothes are worn is a big deal, for instance some men wear bow ties that extend pass their ears. If you were making a case for Bozo the clown, then you made your point! The reality is that dressing takes some forethought. When you are picking an outfit do you look at the patterns, materials and colors and see how they either compliment or contrast each other. Look at men’s fashion publications and be an observer of fashionable men that you see walking down Manhattan (just don’t stare, that’s rude), see how other men wear their clothes, ties and the like. You will find many good combinations by observing well-dressed men. Check out what looks good on them, the colors, patterns and yes even the material all has a bearing on how the final combination will look and work or in some cases not work. Step outside your comfort zone and experiment but do not go wild and lose all self-control. Dressing well is a statement that you have good judgement when it comes to style. 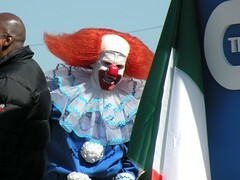 So experiment and have fun but don’t look like a clown when you are out and about. There is a lot to be said today when buying a suit. The off-the-rack JC Penney, Burlington Coat Factory, K&G Fashion Superstore, Lord & Taylors, Men’s wearhouse, Jos A. Banks, or Macy’s brands seems to be the pick of the litter for most men. While Macy’s, Men’s wearhouse, Jos A. Banks and Lord & Taylor offer garments of better quality, the reality is you get what you pay for. Most off-the-racks suits in the $200-$500 range are fully fused suits that are mass produced. I go as low as $200 because if you really want a suit for cheap I suggest you go to K&G or Burlington, these are the kings of really cheap suits and I mean cheap not just in price. However I am knocking anyone, if you like K&G more power to you. However if you would like to start on obtaining suits that may be better quality or get a better return on your wearable investment, here is what you should know. 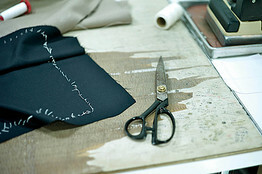 FULL CANVAS – Normally in these suits, a layer of horsehair canvas was placed beneath the fabric of a bespoke suit for support and to retain its shape. Gradually the suit contours to the natural shape of the wearer’s body so that the wearer achieves a perfect fit even after many uses. There are also other benefits but these suits normally are pass the $2000 range. HALF CANVAS – Also used in bespoke suits and most tailors will go this route because it saves time in the overall process and in this canvas variation the canvas is provided in the chest and lapels of the jacket while the rest of the suit is fused or glued together, many top brands go this way and it still provides a good fitting suit that wll last a long time. I think Brooks Brothers is one of the few suit makers that used this process. FUSED – Suits where the material (interlining) is fused with a tape or glue instead of being stitched. Mainly all mass-produced garments. The down-side is that the glue actually degrades, this is seen in bubbling or fabric ripples. Most commonly seen when these garments are sent to the cleaners to often. The cleaners actually rush the process and the degradation becomes very noticable over time. These suits normally do not fit your body shape and wear out over time. Andy Gilchrist, offers an excellent explanation, the best one to date at www.askandyaboutclothes. Look Good In Your Pajamas! Just recently, I purchased two lovely sets of Pajamas from Brooks Brothers. The tailor at Brooks Brothers knows me quite well. Ask me why! It seems that I am the only customer that comes in and ask for the pajamas to have a 1 1/2 inch cuff on my pants. Evidently some of the the sales people as well as the tailor consider me a little eccentric, customers normally have them just hemmed up! All I say is that my style does not end when I am in bed, its something I live with and if some one knocks on my door in the middle of the night, I want to at least look good when I open the door! Just a few years ago, big Windsor knots were the rage, I personally did not wear them but there seemed to be a horde of men, young and old with ill fitting suits that felt the big knot compensated for the fit of the suit. I remember walking into a conference and it seemed like all the men were wearing ties with big knots and I mean old and young alike. It goes to show that many are still driven by trends. I am partial to bow ties myself, but I still see many men wear big half and full Windsor knots. Much of it has to do with the fabrication of the tie, some of the cheaper ties are made from Dacron and Rayon, which can account for its thickness. Better made ties are often fabricated in natural fibers like cotton, silk, linen and wool. There is also the amount of backing in some ties that can produce this knot as well as where they begin to fold the tie, some prefer tying closer to the wider angle of the tie which can also produce this type of knot. Normally the six and seven fold ties are unlined and made from large swatches of silk and accordion folded to produce a rich and luxurious tie with weight that does not twist when making your knot of choice these depending on the designer can also produce larger hefty knots. Many designers today have switched to a doubled four-folded design that is backed and lined and referred to as a seven-fold tie, I think Kiton and Brioni use this process. We can see a return to a more clean and refine look that was once common among men of good taste. By the way when I wear a regular tie I preferred a small four-in-hand knot. In the meantime remember that fashion can be cyclical, your best bet is to stay slightly conservative and wear classic clothing that has stood the test of time. Yes you can play with colors and patterns but the clothes should be quality made pieces that will look good and still be in style 20 years from now. Every Friday in my commute to work, I continually see more vagrants at least that is what I thought! In reality many people have become victims to casual Fridays, the day they can wear any rag to work. For instance some employees show up to work in jeans which is not wrong and it depends on the job as well as the environment. The problem is that many wear jeans that are too big or very skinny. Many combine a mishmash of items to create a look that they feel is unique to them or their so-called generation or personality. Some men may wear very typical items, a team jersey with some jeans or a t-shirt with skinny jeans and sneakers both with plenty of logos (walking billboards). This new casual Fridays work wear is the new look for many small companies, retail outlets, mall employees, coffee shops and the like. It comes with its own attitude. People may feel more inclined to relax when they get to work, take things slow and go with the flow. Its hang-out at work day! In my personal opinion, it reveals a lack of professionalism and the best terms that I can find to describe its overall appeal are sloppy and slacker, like the guys portrayed in movies like Clerks. Regardless of this trend you should still dress appropriately for any activity and for me I personally like getting dressed each day. The dressing up is like going into battle, the better dressed you are, the more you are prepared to meet the day to day challenges and people will notice you, they may not like you but you will be noticed and many will assign positive comments to your appearance as well as give you that often said phrase: “Hey, you look sharp, nice combo”. So forget casual Fridays and dress your best each and every day, you do not know what opportunities may come your way and when they do you will look good going after them. Many of us like to buy great clothes but do not always know how to best care for our gear. Normally when I buy a suit, I just use the hanger that was given me by the retailer or tailor. I noticed that when the suit sits in the closet for a long period of time, what normally happens? In my case, I get a crease in my pants that I have to get out with steam and I notice a slight slump on one side of the jacket from its loose dangling from the Cedar hangers that were provided. So where do you get the proper hangers to ensure that your clothes retain their natural shape and to ensure that long-term creases do not develop that will essentially damage your pants in the long run? Well check out Kirby Allison’s Hanger Project not only does Kirby Allison teach you how to care for your suits but for your shoes as well. His site shows the impressive hangers specifically designed to ensure long garment life and it it also showcases an impressive roster of care related items for your entire wardrobe. His site shows you step-by-step on how to care for those nice suede monk straps that you purchased as well as those nice leather shoes that you love to wear constantly. Head to Kirby Allison’s website, in fact I have already used some of his suggestions. I will be putting in a order for the Saphir shoe polish as well as purchase some travel hangers to keep my gear looking sharp on the road! Remember take care of your gear! The proof is in the details! I am going on a business trip and I need to make a good impression. Many times I get up and fumble through my closet looking for something to wear. The problem with me is while I have a good selection, I tend to wear my favorites pieces all the time. The down side to this habit is that my favorite pieces will wear out with repeated use and will have to be replaced. The second part of this behavior is that it limits what I will wear, so you need to get out of your comfort zone and experiment with colors and patterns. The center piece of the ensemble I put together is my bow tie, I always start with a center piece what I consider the piece that you really want to wear. The bow tie contains lavender and blue, it also contains little blueberry dots that match nicely with the blueberry gingham shirt from Charles Tyrwhitt. The silk pocket square acts as a contrast with its rich blue color and I wanted to wear my brown suede shoes from The Custom Foot with a pair of suspenders from Trafalgar and my two-button grey windowpane suit with peak lapels. Do not forget the cufflinks, burgundy and camel-colored silk knots that gives it the spark that I like in my gear. I think this combo is energetic with a slight dash of preposterous. My point is experiment, be bold and do not be afraid of colors or patterns. I like experimentation coupled with very classic styles. I do not always pull it off but its fun! Get yourself some fashion mags for men browse through them for inspiration and start throwing stuff together, you never know what new ensemble you will bring forth from your closet! I recently took a long walk in lower Manhattan, my walk started at West 4th street and I walked over to the Lower East Side and I covered every street in between. This is my normal hunting trip and yes I mean hunting trip! I take these long walks in different sections of NY from the Bronx to Brooklyn every so often and peruse men stores looking for possible buys. You really have to be diligent when looking, New York has plenty of chain stores and men’s stores that sell cheap clothes, they are often very trendy and ill-fitting and yet even in one of the fashion meccas of the world you see badly dressed people, just check out parts of Brooklyn and its bohemian population. I will find the occasional Marshalls or Daffy’s (Daffy’s has better offerings for men) in my walk and I will stop in and see what they have in stock but most of these stops turn up fruitless, these stores are hit and miss for the most part and you really have to find something of high-end quality to say you got a great deal. Nonetheless I still check them out, the best deals come in the form of vintage stores and small boutiques that I come across that really sell great men’s wear. You will also pass by many custom tailors like Michael Andrews Bespoke in the NoHo section of Manhattan. I recently got a jacket from Michael Andrews and I have pictures of the jacket attached to this post. The real story is that we have a Pinterest page and we are posting pictures of some of the best men’s wear available and the physical location or web address where you can purchase these items for your wardrobe. So I have my link below and make sure to check us out and share our site with others. Many of the clothes are from luxury brands as well as the neckties/bowties. They were purchased in reputable stores in and around NYC. However the Brooks Brother jacket (second photo), and the plaid hanky (in third photo) were purchased online and the jacket needed some minor adjustments, due to my incorrect ordering. As a rule of thumb I use my personal tailor, he knows my style well and makes all my alterations and I take my shoes to a very reputable shoe repair on Park Avenue, which put on taps and non-skid soles, they will help the shoe last for years with proper maintenance. Most of my clothes fit very well, as all men should take great efforts to make sure that they not only look good but that the clothes fit very well. As we always say style is not in the price but in the eye! Here we are three months into 2012 and we have not supplied an article explaining what is going on with Rift Media Group. Well we wanted to highlight the fact that we are changing our name to The Dicky Bow. The term Dicky Bow comes from the UK and it is slang for bow tie. The name is a better reflection of its founder me an avid bow tie wearer, I will not focus only on bow ties but as the main editor and a wearer of bow ties for over 20 years It is hard not to talk about them. I can say with pride that I probably owned somewhere between 300-400 hundred bow ties and have donated dozens to friends and acquaintances over the years. So maybe it is a conservative estimate? Nevertheless, we hope that the new name and upcoming fashion tips will help you truly make the best of your wardrobe. The best thing any man can do is to constantly evaluate his wardrobe and not to make any impulse purchases on clothing. Don’t make the mistake that being trendy is synonymous with being a classy dresser. The reality is classic clothing has staying power and that classic clothing will look good today and still look good tomorrow, if you make the right choices. My view is conservative is best, add some nice pieces that really stand out and you put a new spin on that classic shirt and jacket. So come along for the ride and yes that is me from the neck down. The bow tie is from Barneys and the gingham plaid shirt is from Hickey Freeman. Our next post will have more combinations and we will work on our upcoming look book as well as check out our upcoming pinterest page, where you can post great looking combinations that rock! Adidas recently has been generating a lot of hype in the streetwear community due to their collaborations with designers like Yohji Yamamoto and Kanye West. The UltraBoost are no stranger to this hype, especially the White 1.0 and the Triple White 2.0 which usually sell out very quickly. I was fortunate enough to grab a pair at my local Foot Locker before their shelves consisted of only boys sizes. The UltraBoost itself is a very light shoe, good for running or just generally being on your feet all day. The most notable thing about them to me is that they are, by far, the most comfortable shoe I have ever worn. The midsole is made of thermoplastic polyurethane, unlike most running sneakers which have midsoles of foam rubber. To my knowledge Adidas is the first (and so far only) company to use this material for their midsoles, but I find it infinitely more comfortable than a normal sneaker. The boost was comfortable on it’s own, and their insole only makes it more enjoyable, not to mention the fact that the inside material is a soft neoprene. Think of it as wearing a pillow with a sole. The outsole is tire rubber, as Adidas has joined forces with Continental to make these shoes as grippy as possible, and they have succeeded. I don’t recommend skateboarding in these, though they are literally sitting on a skateboard in this picture. The mesh is very durable, and as far as I know from cleaning them with a soaking wet brush and some Crep Cure, don’t let that much water through to the inside of the shoe. It’s a very tight shoe, so if you you like your shoes to fit snug, get your true size. If you prefer a bit of room, go a half or even a full size up. The downside of triple white is that, as with any white sneaker, it’s a dirt magnet. The cage on the outside of the UltraBoost is especially hard to clean, as it stains easier than expected. The only other problem is it’s pricetag of $180 (USD). Some wouldn’t find issue with this, while others may view this as a steep price for a pair of sneakers. However, as with dress shoes, you can feel the difference in the quality of the shoe. Overall, i’d rate these sneakers 9/10, only because they get dirty fast. The black pair may just get a 10. If you haven’t tried a pair of these on, you definitely should. You might like them so much you actually buy them.